A NOTE to all those who have not signed up yet: Please still do so!!! Even if you feel as if the challenge has already started, there is plenty of time to build for all three categories! Ulandus needs members the most, followed by High Council, then the Desert King. 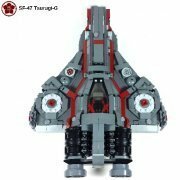 Aftermarket products that cannot be replicated in LEGO are accepted, but should not be the defining element of a MOC. Weapons / armor from aftermarket sources is always fine. The Civil War is a three way battle between the Ulandians, the Desert King, and the High Council of Kaliphlin. You may sign up for the civil war on this page. The roster is at the bottom of the post. When signing up, please note your first and second choice. We will attempt to put everyone on their first choice team, but if the teams get too uneven, some people may get their second choice. There will be three categories to this challenge. 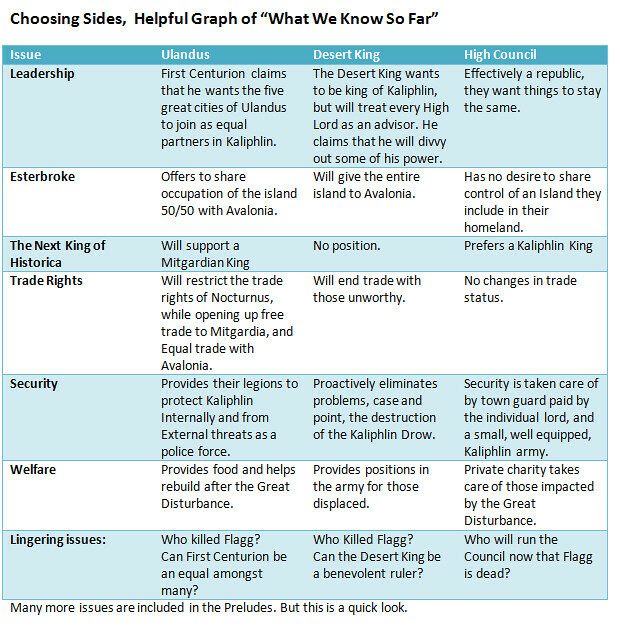 The winning and runner-up side of each category will earn points towards determining which faction won the civil war. In this category you will show something that has changed since the war started. For example, It could be a MOC about a boy becoming a man because he has to work his dad’s farm, a MOC of a person turning to a life of crime after their livelihood has been destroyed, refugees, the aftermath of a battle, etc… Anything that shows how a individual(s) life has changed because of the war. The build should clearly represent a defining moment in a person or person(s) life. Story is not a major factor here, but it may help you clarify for the readers. Restriction: 32x32 studs with reasonable overhang. The story of sir Brick-a-lot. 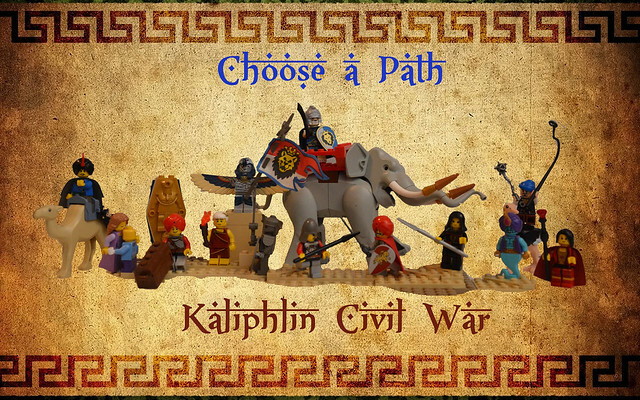 It is your job to chronicle Sir Brick-a-lot’s journey in the Kaliphlin Civil War. Sir Brick-a-lot can be your sig fig, or another fig you used for the war (no, don’t actually name him Sir Brick-a-lot). The fig does not have to be a soldier, but you should have at least a couple builds to tell their story during the Kaliphlin Civil War. Each side will be judged on the quality of the builds presented and the quality of their Heroes’ tales. If you use your Category C builds in your storyline, there is a limit of ½ of your builds may be from Category C builds. IE: If you want to use 3 of your category C builds, you must have three additional MOCs to add to your story. Please see this thread for now on the rules. This is the actual "game" thread. It has links to the mini-challenges for each week. Please do not sign up on the preliminary rules thread, please sign up here. Also, all discussion for Category C should happen in the category C threads, that is where you will report MOCs for that category also. Although it may be premature, each side is throwing a victory parade in their regional capital. Builders should put together a parade in no more than six pictures. There should not be more than six parade groups (bands, floats, military units, Zem Zem go-cart formations, etc...) in your parade. Although this category will impact the outcome of the war the least, it does show to some extent the pride your side has. There is no limitation in sizes, but remember to photograph carefully for detail so that all of your parade is covered well. Finally, there should be a final picture that shows the Grand Marshall of the Parade's stand with all the dignitaries inspecting the parade. The winner of this category will be known as the Grand Master of Ceremonies of Kaliphlin. LDD - LDD will be allowed in Category C and D, but not in Category A or B (as it has always been with official challenges). Since Category C is voted on by the public, there may be people that have some bias towards digital bricks, but we will let that play out. IF I missed someone from the other thread, please let me know. The war was fought at a blistering pace, and I expect all the hard work that went into Challenge C left many people unable to muster up entries for the other three categories, but we still had some GREAT entries. So, below are the individual winners of each category and the victorious side. After which is an epilogue. So what does this mean? War is messy, and rarely there is a clear cut winner. We can see the same is here. The Desert King’s forces have shown prowess on the Battle Field, the legions of Ulandus have fought valiantly, and the High Council has scrambled to keep control of what it can. Like Nocturnus, Kaliphlin still boils over. As long as there is a Desert King and a separate High Council, it is unlikely that there will be true peace. With First Centurion still banished to another plane of existence, the Isle of Gorr remains a holdout for Ulandus supporters. There is also a underground resistance on Ulandus proper. The High Council sits in the West, and with many of Nocturnus’ warriors heading home for their second Civil War in two years, the Desert King has lost most of his grip on the Wither Woods and beyond. Rumors of negotiation between what’s left of the Ulandians and the High Council still swell, but it is a well-known fact that during the active portion of the war the two sides could never come to an agreement. Heralds of the Desert King has been to every town save those of Esterbroke and Gorr, where the DK's influence waned significantly after the unofficial armistice caused by the supposed death of First Centurion and the taking of Petraea. The message is clear. "Loyal soldiers of the Pharaoh must return to Sultan's Gate and prepare for the next revealing of prophecy for the Great War. All Noble subjects of Kaliphlin who fought against the One True King shall be forgiven for their transgressions if they send a troop of warriors in time for the prophecy's revealing on December 1st. Those who do not send their good will, will be made to heel in good time." It is suspected that the alliance between the Desert King and the united rebel forces of Nocturnus will come to fruition, as he sets his troops against the Spire in the months to come. The present state of Kaliphlin is in flux. It takes money, men, and will to wage a war; all of which have been spent over the last year. As fall turns to winter, the last of the very few farmers return to their much destroyed fields to bring in a possible harvest, and to avoid starvation throughout the Guild. Soldiers that have survived take temporary leave, as few armies are still standing during the lull. Mercenaries have moved on, many traveling east in hopes to find new sources of coin. The only occupied cities are those of Ulandus, where the DK's main regiments still hold his hated enemy's high seat. Matters of administration are shaky at best, as the West turns to a new Council, the East has mostly pledged to the Desert King, and Gorr keeps hope that First Centurion will return to liberate his lands. On Esterbroke, Petera MacLean has completed a cleansing of Desert King influence by killing all the traitors of the island and firmly asserting Council control of the island. Refugees of the middle-lands of the guild board GEAR ships and sail to the island, thus making it impossible for the Desert King to seed the island to his Avalonian allies. One thing is clear, Kaliphlin has changed, A clear leader has not emerged, and the Desert King's grip on the guild is tenuous at best. Can he become beloved? Will the First Centurion return? Will a High Council Member elevate to sovereign to reunite and rebuild the guild? Ser Beorthan and the wealth of the Trifork will support the High Council, as we cannot trust any powerful king or faction on our borders. The Sand King is unlikely to stop at the border, and the First Centurion seems set upon establishing Kaliphlin as a vassal of Ulandus. I'm the same case as Gunman. First choice High Council, second choice Desert King. Lord Robin sides with Ulandus (second choice: The Desert King). Yay! I'm looking forward to this one! The great Goblin Uniter declares for the Desert King. (Second choice the Council). No problem here... As I said in the other thread, I don't really expect everyone to build every week. I know some of you will, but I think most people will build one or two builds a month, depending on how much time they have to plan. I also knew that some of you have a lot of other projects, and may not participate at all in Category C.
On another note, People should sign up for their faction, even if they are only doing the first two categories, so when judging time comes, we know where to lump you all! I noticed my name on both the desert king and ulandis. Typo maybe? I can go with that! Are aftermarket parts, like Brickwarrior accessories, permitted in this challenge? The High Council has my Blade. I assume that sin since I have joined Kaliphlin I am allowed to declare? So many High Council sympathizers! Absolutely, I think this has been the case in the past. I don't think it was for the Nocty challenge. It usually depends who is organizing the challenge. A few prominent GoHers are purists and they usually design contests, especially the smaller ones, to reflect that. Bigger ones usually allow aftermarket stuff but it should probably always be mentioned clearly for every challenge since this question comes up often. I am joining the Desert King's forces. No second choice necessary !?! Pleas sign me up for Ulandus. Free trade with Kaliphlin, sounds great! I don't mind being in either of the others if I can't join Ulandus. As second choice to the Council. Jakorin and the forces of Anvilon stand with the High Council. Second choice would be Ulandus. [Edit] Also, how do I get a GoH tag? Participation in official guild challenges and lots of patience!